In the research CKBG uses different online environments, in relation with the purposes, the specific users and the theoretical frame. The main environments are listed above. 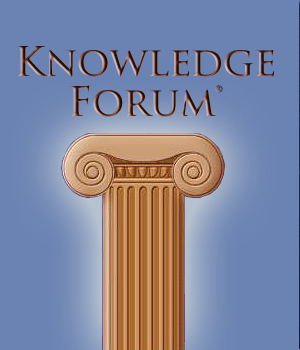 Knowledge Forum is an on-line collaboration environment created to support the work of a community. Its origin dates back to 1983, when a research group at the University of Toronto coordinated by Bereiter and Scardamalia designed a first prototype and then piloted it on a university course. 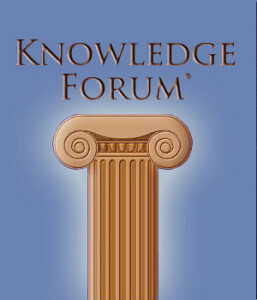 The key feature of Knowledge Forum is the ‘knowledge building’ philosophy which guided its design. The entire environment is de-signed to support and foster the building of new knowledge by the group. In its database, in fact, users can generate notes (written texts to which graphics or images may be added) and also cite other notes or highlight key words in their own text: the user’s own note is easily identified by a search tool which enables reading of the entire database by topic. The notes can be also be interconnected by means of links. In this case, they are denoted with the term ‘build-on’, which indicates that they represent developments in the knowledge building activity. To facilitate discussion, also present are predefined linguistic structures to foster expertise in writing. These are ‘thinking types’ (or thought labels) which act as ‘scaffolds’ in the sense that they serve to create shared categories of discourse construction. These structures are flexible and customizable. Synergeia is a web-based platform designed to support collaborative learning processes. It was developed and piloted within the European ITCOLE project. The features of the Synergeia software which most closely concern collaborative learning are document sharing and knowledge building. The software permits, in fact, the rapid uploading and downloading of documents in any format, textual or multimedial, organizing them and commenting on them in the common space. 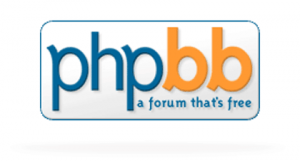 The knowledge-building areas are discussion forums in which each participant can post messages to start a discussion and/or reply to other posts, contributing to the collective construction of meanings. This asynchronous communication tool clearly evinces the socio-constructivist inspiration that drove the design of the entire platform. In particular, these areas have been designed in accordance with the progressive inquiry model (Muukkonen, Hakkarainen, Lakkala, 1999), in which learning is conceptualized as a search process undertaken to gain better understanding of a concept or a question through group discussion. PhpBB is one of the most widely used open-space bulletin boards written in the PHP programming language. The base versions do not comprise specific functions for collaborative learning or e-learning. However, the program’s ease of use allows its application in a wide range of contexts. In fact, through simple changes to the codebase, further modules (‘MODs’) can be added to enable distance teaching functions. The version used for the experiment, in fact, comprised specific functions enabling the attachment of files and insertion of material in the download area; the construction and moderation of interaction groups; the delivery of support materials and online tutorials; the creation of personal blogs; Dokuwiki (construction of shared documents in Wikipedia style); and statistics on use. Celebrate con noi il decennale del CKBG!